Have you noticed that some very long numbers are very big whilst other very long numbers are small? Can you think of an example of each? Here's a game where you can test your skill at putting small numbers into the right order - it's not as easy as it sounds! You'll also need a copy of the game board and two different coloured pencils. 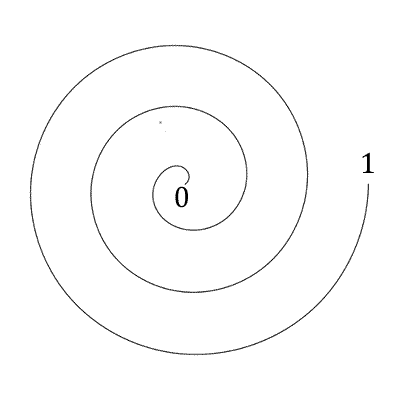 Take turns to choose a number from the grid and mark it on the spiral. Make sure you know where $0$ and where $1$ is! Keep taking turns until one of you has marked three numbers next to each other. Can you work out a winning strategy? Does it matter which number you choose first? This game is to help children learn how decimals are ordered, without worrying about exactly where the decimals should go on a number line - only the order of the numbers matters in this game. Easier version: try this version, with decimals with one decimal place which need to be placed between 0 and 2. Harder version: encourage the child to make up a different set of numbers, with different start and end numbers for the spiral. When you've completed a game, talk together about good strategies. Does it matter who goes first? Does it matter which number you choose first? Collaborative. PrimaryGames-Strategy. Working systematically. Resourceful. PrimaryGames-Number. Games. Visualising. Generalising. Addition & subtraction. Interactivities.